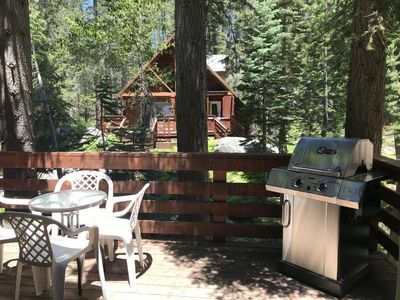 Create lasting memories with family and friends in this vintage knotty pine cabin furnished in period décor with the comforts of modern amenities. This very special property offers a truly unique experience. 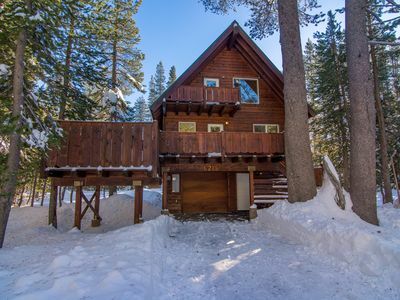 Feel the magic of this authentic 1930's Vintage Tahoe Cabin while enjoying the Yuba River in the back yard. 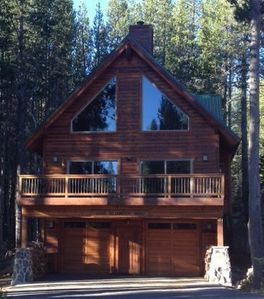 This non-smoking cabin is 1700 square feet featuring a knotty pine interior with log accents, a beautiful big stone fireplace, a separate dining area, modern heating, and a large back deck facing the river. 4 bedrooms and a sleeping loft. Sunny in summer, snowy in winter (see special winter info below). 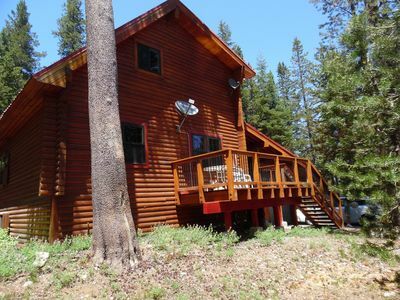 Located in the friendly and quaint community of Kingvale near Donner Summit and Soda Springs. 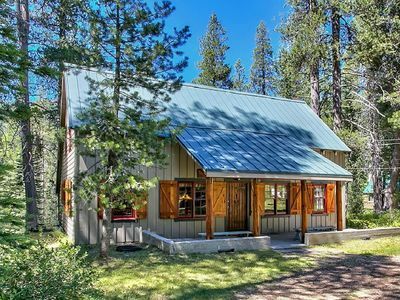 Situated along the South Fork of the Yuba River, Kingvale is a forested community of charming 1930's & '40's cabins and unpaved roads - it's almost like going back in time. 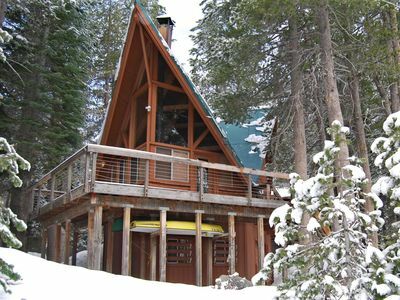 Enjoy a magical retreat where you can relax and play in the summer sun or the winter snow. There are only a couple of owners who rent their cabins in Kingvale. This is a unique opportunity to share in the magic of this cherished place. 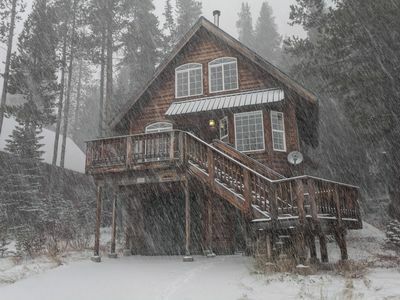 Cabin features a spacious living room with stone fireplace, 4 Bedrooms (3 Queen/1 Full), a Sleeping Loft with 2 twin beds, 2 Bathrooms, a well appointed Kitchen with adjoining Dining Room. 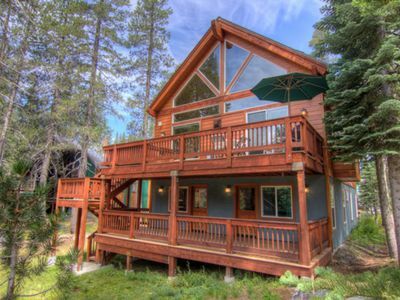 Enjoy the Yuba River right in the backyard from the back deck. Games, puzzles, books, snow shoes, sleds, DVDs, WiFi, and more available for your use during your stay. 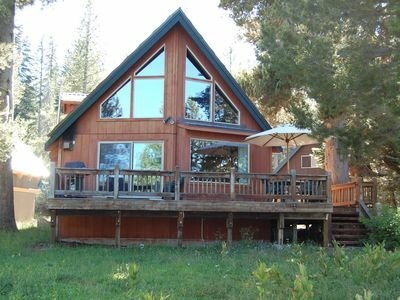 Enjoy all the Tahoe National Forest has to offer while avoiding the traffic of the Tahoe basin. 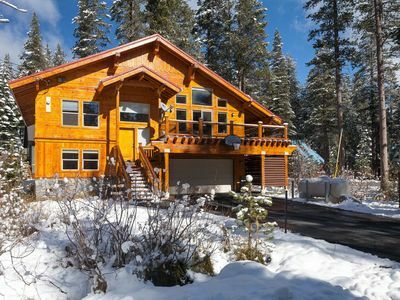 Whether you enjoy hiking, rock climbing, bird watching, snow skiing, snow shoeing, boating, fishing, hunting, or just relaxing, the location offers something for everyone. 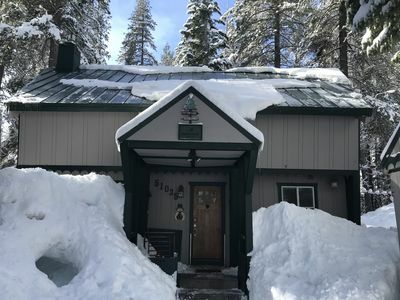 Minutes away from local SKI RESORTS including BOREAL & SUGAR BOWL (5 miles), DONNER SKI RANCH(6 miles) and ROYAL GORGE cross country (4.5 miles), NORTHSTAR (21 Miles), SQUAW VALLEY (21 miles). 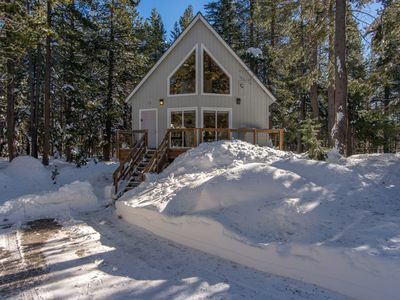 And, just 14 miles from Downtown Truckee. 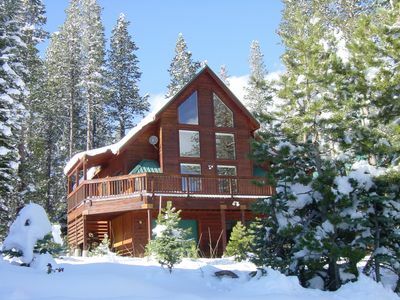 Local attractions include the Historic town of Truckee, Donner Museum, Donner Lake, Yuba and Truckee Rivers. 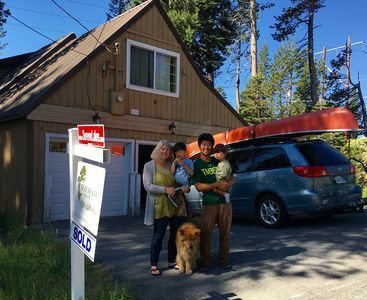 Close to the Pacific Crest Trail and a short scenic drive to Lake Tahoe or Reno. 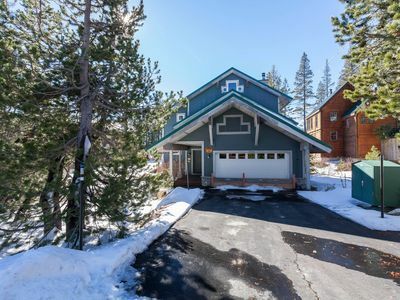 Located off beautiful historic Highway 40 (Donner Pass Rd). Great location when traveling from Sacramento or the SF/Bay Area via Eastbound Hwy 80. Easy access on and off the freeway. Drive to the front door in Spring, Summer & Fall. A short “2 block” walk from the *parking lot during Winter months -- like the olden days. *** Standard Dates require 2-night Minimum Stay. *** Holiday Weekends and Special Event Dates require 3-night Minimum Stay. *** Weekend Rates reduced to Weekday Rate for 7+ night bookings. *** Discount available for repeat renters. 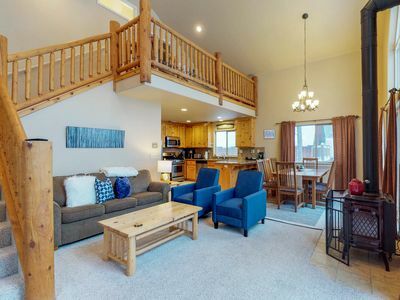 8 GUEST MAXIMUM: In order to minimize wear and tear on the cabin & minimize impact on our quite mountain community, we have a strict 8 guest maximum, including children. Primary Renter must be 25+ years old and must be present at all times. 2 WINTER PARKING PASSES provided – STRICT 2 CAR MAX during winter season. 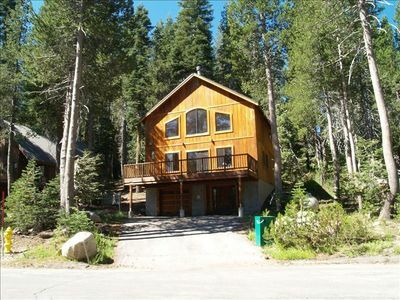 There is a 2 block walk from the Winter Parking Lot to the cabin. It is strongly advised you ARRIVE BEFORE DARK as there are no street lights or street signs and it will be difficult to find the cabin if you have never been her before. Come prepared for snow and cold weather. That means you may need a vehicle with four-wheel-drive and/or snow chains. Bring proper snow gear to stay warm and dry. Check weather forecasts and road conditions before you come. 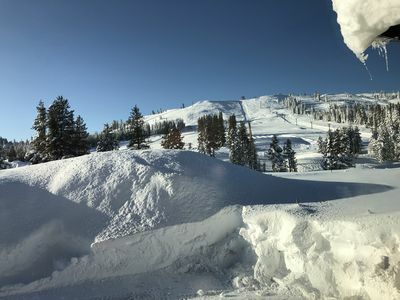 Donner Road between the Soda Springs and Kingvale exits is snow plowed frequently as the Cal Trans station is located there. NO REFUNDS ARE MADE DUE TO WEATHER. Plan ahead and come prepared. 'Penrod Home' Beautiful Large Family Home. Close to the lake! 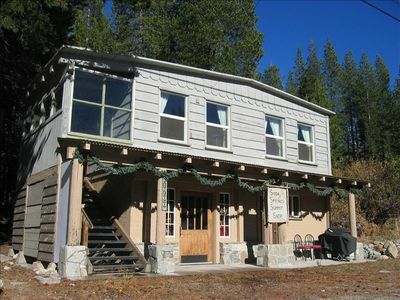 Soda Springs Cabin 5 minutes to SUGAR BOWL, ROYAL GORGE, DONNER SKI RANCH!! 'Mnt Getaway', Cozy mountain getaway. Across the street from lakefront. 'Eddie Bauer Home'- Walk to Royal Gorge Cross Country Summit Station. "Alpine Retreat" A Perfect Retreat for your Alpine Adventures. Sierra Retreat Second to None! 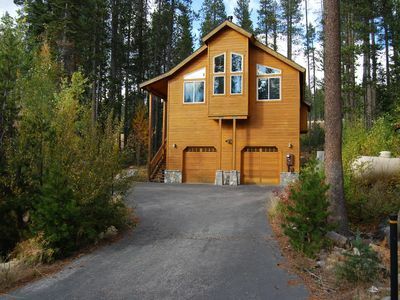 3BD+Loft/2BA Serene Lakes (Donner Summit) Home with Hot Tub, Pet Friendly. 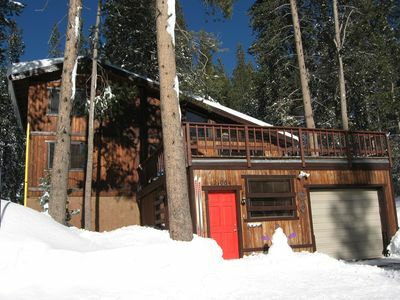 Cozy, family-friendly cabin w/ easy access to the slopes, lake, & trails!